Elaine Ng (吳綺莉) panicked when her 18-year-old daughter, Etta Ng (吳卓琳), disappeared without a trace for five months. Family and friends could not reach Etta, so Elaine called the police and filed a missing person’s reort. It turns out Etta had gone to Canada with her girlfriend, Andi. 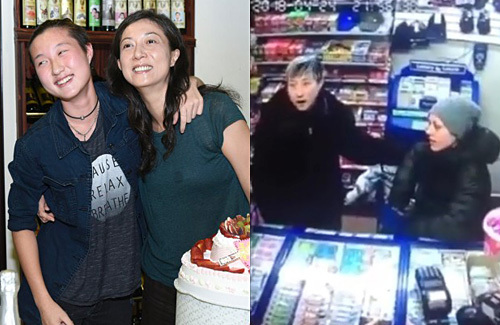 In a new clip that emerged today, Etta and Andi were at a convenience store in Canada. Etta looked tired and hopeless as she said to a Chinese man at the store, “I want to find my father… My mom… I know. But my mother….” The footage was taken from the store’s security camera. Teenage angst hit Etta full force while growing up. She had called the police on Elaine for physically abusing her. Last year, Etta was hospitalized for suicidal tendencies and was spotted with more than 20 cuts on her wrist. She announced she was gay and in love with 30-year-old Internet personality, Andi. Running away from her mother’s home, Etta moved in with Andi. As if this was not enough drama, Etta and Andi left for Canada without telling Elaine, who panicked over her daughter’s safety. Glad to know her daughter is safe, Elaine did not want to talk about the situation in detail. She said to the press, “I’m a little busy now. I’ll talk later.” Elaine was out with a friend and hoping to find a solution to her problems. Elaine must have thought she hit jackpot when pregnant with Jackie’s child but turned out in such way. I am sure Jackie has his reason for not wanting Etta in his life and support them financially. But really pity the child to be caught in such situation, as no matter what, children are innocent. To put it harshly, Elaine got pregnant hoping to trap Jackie into marriage. The baby was a pawn to get what she wanted, but it didn’t work. this is so dramatic, the child is indeed innocent I can’t believe Jackie Chan still doesn’t want to meet up with he child. i know right, how heartless do you have to be to not want or deal anything w/ your own child?! @m0m0 When Jackie had the affair with Elaine, he obviously didn’t want any children. But Elaine spoke to the press and even threatened to get a DNA test to prove that she had Jackie’s baby, which he at first denied. I think it’s Jackie’s pride and resentment towards Elaine that makes him not want to deal with Etta. In press interviews, he admitted he felt bad over what Etta has encountered but he hasn’t offered a helping hand. Maybe he felt this was a child Elaine brought into the world and she has to be responsible to Etta. Yes, it’s very cold-blooded and the child is innocent, but unfortunately Jackie hasn’t helped the Ngs when they needed him the most. Jerky Chan is a terrible human being. I hope he will regret not acknowledging his daughter on his deathbed. It is clear to me that Elaine and Etta both have a lot of emotional, mental and psychological bagage which they need to deal with, right now. Second….Etta is a counsenting adult, but despite that fact, she is yet young. I understand that the relationship between her and Elaine is estranged, but the least she could have done was let her mother know she is okay, and in Canada. Her so called lover Andi is 30 years old, she could have let Elaine know where they were, or speak to Etta about letting her mother know whete she was. This Andi woman continues to be such a poisonous influence in Etta’s life. Third….from reading all the articles above this one, and this one included, it does not take a genius to figure out Etta and Andi are broke and desperate. They appear to be going through very rough times financially. Etta did not seem to have any interest in getting to know Jerkie Chan at at. In fact, she was adamant in not wanting anything to do with him. Why the sudden and pathetic 360° turn? Something tells me this was all andi’s idea, as she was after money in the first place. This situation is not going to end well, I can’t shake the bad feeling that has come over me. Etta needs to forget about Jackie Chan. He is not even a father figure to the son he had woth his wife. What makes Etta thinks he’s going to be a dad to the child whose mother he thinks purposely became pregnant to financially gain from him? @bubbletea yea, as much Jacky is being a jerk, at one stage, you need to grow up and learn that the parents you hope you get, you will never get it. But I guess this is based on each person’s maturity, and it does sound like this Andi is a poison. At least I hope once Etta hit rocks bottom, she will learn and bounce back up. I don’t understand why Etta still want to find her father? If her father had nothing to do with her anymore isn’t it? Don’t she realize who gives birth to her and raised her when she’s still a child? Etta needs to grow a backbone and find some strength within herself, instead of feeling like a victim. She sounds really immature. So she grew up without a dad … well hullo … so did many others, and many turned out just fine, or even stronger. Some people have more tragic stories – fathers who died early etc and they had younger siblings to take care of. Her mom tried to raise her alone. So it wasn’t perfect, but nevertheless her mom DID try and raise her as best as she could, as a single mom = that’s what Etta should focus on, rather than what she missed WITHOUT dad. C’mon a dad who doesn’t want you – WHY would anyone want to see him? Wake up and realize that reality is nowhere near idealism. Use those stones to positively empower, rather than reactively act out. As for Jackie – methinks his balls are tied – he doesn’t want to further offend wifey Lin Fong-chiao. Afterall, she’s his CFO. I agree that there are many people who suffer even more tragedies but still turn out well. Vivian Chow lost her father before she was even born so her mom had to raise her as a single mom. Luckily her grandmother helped as well. Anthony Wong was abandoned by his father but still ended up successful even though it was hard, he never gave up. However, deep down he still longed for his father’s love which was why he tried to look for him. Luckily, he never gave up and finally found his brothers and father’s family. It ended up well for him but I wonder if Etta will be this lucky? But she has to have the will and be willing to work hard. She has bad influence that she needs to get away from if she wants to start afresh. I find it pointless to try to find a father that knows your existence but yet does not care for you. Maybe she mistakenly thinks he will help her just because she is his biological daughter? How wrong can she be? If he wanted to help, he should have done so years ago. She should grow a backbone like you said, become independent and mature so she can live her life well. She is lucky to still have her mother. I am an orphan now so I know the challenges that we must all face and we need to be strong so we can become successful and not let our parents.